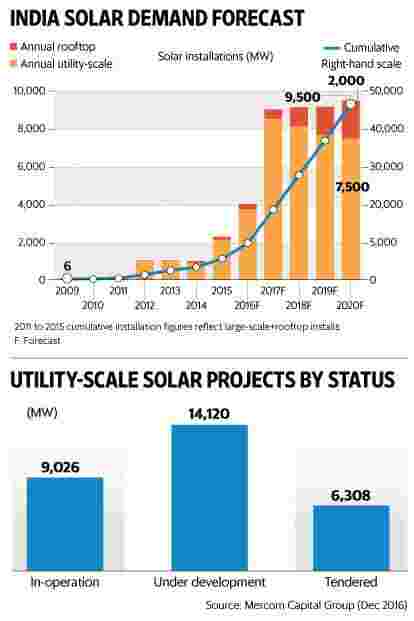 Mumbai: Solar energy capacity in India could nearly double to 18 gigawatt (GW) this calendar year as large projects get commissioned, despite the short-term hurdles of power curtailment and weak tendering in some states, according to sector experts and power producers. India had a total of 9 GW of solar capacity, including rooftop projects, as of December. During 2016, the country added about 4 GW of solar capacity—the fastest pace till date. A large number of projects are expected to be completed in the current year. During 2017, the solar sector is likely to add close to 9 GW of capacity—taking its overall capacity to 18 GW and the country into the league of nations such as China, the US and Japan in terms of solar capacity, according to consultancy Mercom Capital Group Llc. A total of about 14.2 GW of solar projects are currently under development and tenders for about 6.3 GW are still to be auctioned, Mercom Capital said in a 4 January report. ALSO READ:Will low module prices continue to prop-up India’s solar ambitions? Bridge to India, a renewable energy-focused consultancy, expects India’s solar market to grow by 90% in 2017 and reach about 18 GW in total capacity. It expects the country to add a total of 8.8 GW of solar capacity in 2017, including about 1.1 GW of rooftop solar installations. The sector is beginning to see the actual effects of the ambitious target adopted by the government, said Vinay Rustagi, managing director, Bridge to India Energy Pvt. Ltd. “The large capacity addition this year is purely a case of how timelines work for these projects. Because the government was formed in 2014 and they announced the new target in 2015 and the bulk of the large tenders started coming out toward the end of 2015. So these are the projects which will start getting implemented and commissioned in 2017." Rustagi, however, said the expected capacity addition is much lower than the government’s own target of 12GW for fiscal 2017 and 15GW for fiscal 2018 and also lower than what the tendering pipeline suggests. India has a target of setting up 100 GW of solar and 60 GW of wind energy capacity by 2022. The growing energy sector requires $250 billion in investments to reach this target. A cause of worry for the sector has been several instances of state power distribution utilities (discoms) unplugging their generating capacity from the grid and delaying both payments and the signing of power purchase agreements (PPAs) with renewable power producers. To add to this, project auctions have slowed over the past three months. According to industry statistics, government agencies auctioned only about 1,300 megawatt (MW) of the planned tenders for 3,700 MW during the September-December period. “There is a very clear laid-out path in terms of achieving the 100 GW of solar capacity. There were a spate of tenders, which came up in earlier part of last year until September, then there was a lull for two-three months, but tenders have picked up again and there are a lot of bids currently lined up. We are very confident that this growth will continue," said Ravi Seth, chief financial officer, ReNew Power Ventures Pvt. Ltd, one of the largest renewable energy producers. Incomplete infrastructure at solar parks in India has been hurting the development of some large-scale solar projects. A sharp fall in solar module prices, however, has helped renewable energy producers, who have won solar projects at aggressive tariffs. Despite these hurdles, a large number of overseas investors including pension funds and infrastructure-focused funds have committed sizeable investments in the sector. On Thursday, World Bank arm International Finance Corp. said it bought an equity stake worth $125 million in Hero Future Energies, the renewable energy arm of Hero Group. “There are significant headwinds in terms of transmission and evacuation issues that could threaten the pace of growth," said Raj Prabhu, chief executive and co-founder of Mercom Capital.